Brightness Levels are for dark skins! I see the UVs for Genesis 3 characters getting changed to Base and Victoria 7... is that intentional? Nope. I have mentioned that in my product description. If you have UV Fitting "problem", just select all surfaces and choose the propper UV Type for your character. So before apply shader just remember character's UV type. Its not a product's issue but you have to make this simple "fix" for some characters. Good to know. A little more detailed readme with this kind of advice would be great. You have absolutely right! A guide will be coming soon! This product was too difficault for me to make it balance with all kind of Genesis Figures. And I know its new for you to understand how its working from the first day. But I believe that you will be very satisfied with the results, so please forgive me if I was missing out a simple guide. Does it only work with Daz3D figures, or will it work with figures that can be imported into Daz Studio? I hear you are saying that Anagenessis for G3 is a completely different product. BUT, if I buy the new Anagenessis, is there any reason to own the old one? It appears that the new product REPLACES the old one completely. If that is not the case, please explain. Okay...So, what is the benefit working with all maps as opposed to the way the new version handles things? Is the output quality better on one or the other version? If it doesn't make any difference, why would I want to own version 1? So, the new version just makes everything render more red? My DS program is on C: my 'DAZ' content is on D: and my Poser content is on F: and it fails on V4 for me. Not convinced I am doing it right as I have doubts about the 'All Genesis (including V4 and M4)' statement as V4 and M4 are NOT Genesis, even if Genesis can use the Gen4 materials natively. It does make quite a change to the result, under the same lighting, so it takes a bit of getting used to. After the pasting I selected "torso" and "anatomical element" and checked where the value showed a questionmark - here I set the value/color manually to the value of the torsovalue. Well, I fell off the fence and bought NGS, and I'm happy with it so far although I'm a bit short on time to experiment as I've got a queue of renders backing up that I need to be doing. Hence the fairly small before/after comparison. It's not much, but I hope it helps someone who might decide to buy it while the introductory price is still in force. The lighting here is the default DS lighting and the only change between the before and the after is the one-click NGS G2 preset. 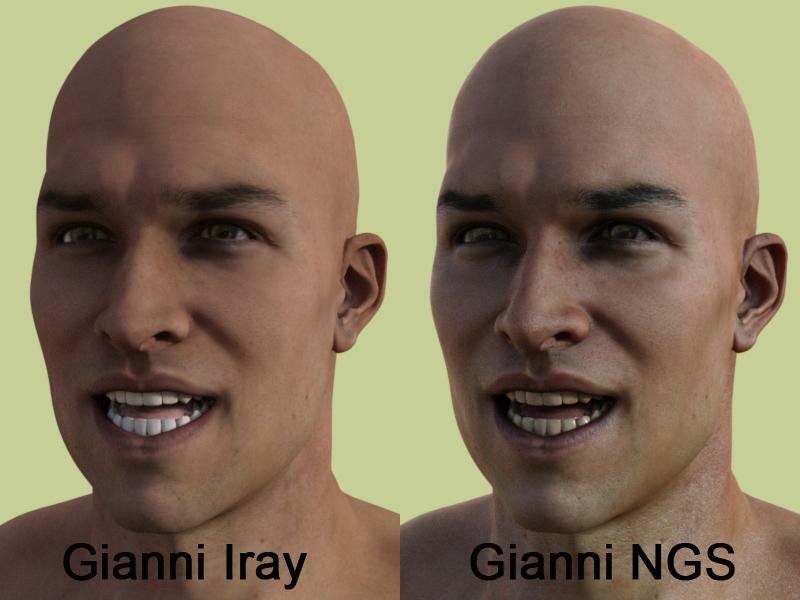 On the left is Gianni 6, wearing the default Iray shaders and apparently opening his mouth to guide passing ships safely to shore using his dazzling white teeth. On the right, he's wearing NGS and his days as a lighthouse are behind him. I think he looks better all over for the NGS treatment, but especially his teeth, lips and eyes. The only other Iray preset I've got for him turns his eyebrows red, so this is a huge improvement. Stupid question, is this for iRay? Does this work with layers added? I am thinking of 'home-made' tattoos, skin blemishes, etc. Is it possible to use this to create such items? I got it so hopefully it will be good. Has anyone tried this with geografts? Reptilian, for instance? Do they improve the characters as a whole or is there a weird seam where the geograft joins the body? Has anyone tried to render N.G.S. Anagenessis II - Revolution in 3 delight? Sometimes iray items look great in 3 delight. . I just bought it today and I am eagerly experiment with it. I will post what I render. Wish me luck. I tested with Minotaur 6, after applying the shader manually to the geografts (legs, tail and anatomical element) there was NO weird seam in the surface. Still have to try others. Dimension-Z metioned that he will provide a script to apply to the geografts - so no manualyy alpplying then. So how does this compare to the Iray Smart Converters by V3Digitimes? I have all of them and I love them. They are also easy to use and offer several options. Also, the Smart Converters have features to apply the settings to genital props, which NGS does not (for now it seems?) However, Smart Converters are separate products for each generation of figure. Does anybody have a render comparing NGS to Smart Converter? I am curious if there is a way to preserve existing diffuse tints added to darken and tan skin? I have a character with tanned skin and this tool makes him quite pale. will it work with a diffuse map that is just a photograph of a cat? or a fox? This was done with just the default setting. That last one looks too red IMO compared to the first two. And that's this product?